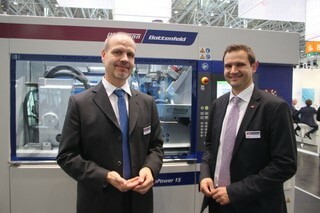 Last November saw an ambitious and ‘live’ twin shot moulding cell producing medical parts Compamed in Hall 8b. The exhibit featured a Wittmann Battenfeld MicroPower 15/10H/10H unit with a four cavity mould unit supplied by Wittner, Austria. The cell also included an integrated rotary table together with camera inspection facilities. WIBA UK Managing Director Barry Hill says that “our continuing presence at the annual Compamed exhibition is impressive since demand for med-tech injection moulding is set to increase over the coming years. The machine frame cell of the Wittmann Battenfeld MicroPower injection-moulding machine is closed on all sides. The unit thus effectively becomes a stand-alone clean room cell. The internal space provides for automation, rotary tables, dryers, temperature controllers and other product-specific options. The flexibility – and cost-effectiveness – such a unit offers is growing in popularity since its launch. The razor-thin, spherical membrane parts were twin injection-moulded from PP and EVA9 materials. The parts were processed in a clean-room environment (class 6 clean air according to the ISO 14644-1 standard). This was created by using a laminar flow box inside the machine. The parts were then removed by a W8VS4 SCARA robot from Wittmann, specially designed for the cell. They were then inspected by a camera system integrated into the machine and then deposited on a conveyor belt.